It is hard to believe as Jimmy Auburn celebrates is 100th birthday that he started his running career in 1926, the Jimmy Auburn second from left`Chariots of Fire’ era. His first efforts were at the Stanley Athletic Grounds, later occupied by the Stanley Abattoir. In those days the track season opened on Good Friday and athletes were expected to turn up the night before to tidy up the place and possibly get in some last minute training! Eventually he found himself attracted into the ranks of Liverpool Pembroke Athletic Club which was enjoying a post-First World War boom and were to dominate local distance running for two decades. The track season consisted of meetings scattered all over the North West and still a Youth in 1927 he enjoyed his first success with a second place in the Liverpool Police Meeting He had similar joy elsewhere in middle distance events in Earlestown and St Helens. 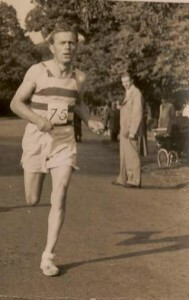 The winter approached and in his first cross country season he was second in the 1928 Northern Counties Championships Youth Cross Country Championships. He was now well and truly bitten by the running bug and the 1930`s saw him become a regular member of the powerful Pembroke squad both in cross country and road running. In between he posted numerous track successes, particularly in the mile handicap races he relished. A highlight of these meetings were the Two Mile Team races, four to run and three to count and where tactics were as important as speed. 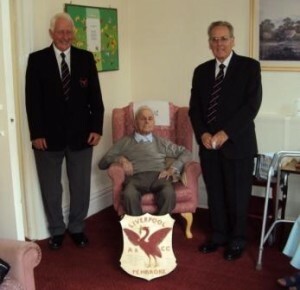 Pembroke were the local king-pins and their ranks contained internationals like Norman Jones.Jimmy still competing 1952 They collected a staggering total of 27 wins before the outbreak of World War Two and Jimmy was a regular member of the quartet. He was also part of the club team that finished third in the News of the World Manchester to Blackpool Road Relay classic. He excelled also over the country and there is barely a local team result, especially the Liverpool and District and West Lancashire Championships, that over ten years did not contain his name. The war brought almost a complete stoppage to athletics but in 1946, now in his mid-thirties, Jimmy took once more to the track, country and road. In the first post-war Northern Championships at Radcliffe he finished 9th and later in the National Championships at Reading he was 51st. No mean achievements in what was a golden period for distance running. Meanwhile he resumed his track career taking a third place in the Northern 6 mile event at Fallowfield behind Pembroke’s new star, Trevor Holt, and Manchester’s Norman Ashcroft. He also rejoined the clubs` successful two mile teamers. Amazingly in the 1950`s and well into veteran status he could pull performances out of the bag and startle team mates half his age. Gradually anno domini took its toll but his love affair with running continued and he remained around for many more years. Eventually he was down to spectating and his diminutive figure would prowl the local scene offering gentle encouragement to the next generation. Occasionally he would spot me when I was then the secretary of Pembroke and, without a word slip, an envelope in my hand. It always contained the entire interest that had accrued in his savings account as a donation to the club he loved. A modest, almost shy, individual he summed up the characteristics of a long forgotten age, loyalty, team spirit and sportsmanship. A wonderful person to know.